"YOU CAN'T ALWAYS BE THE STRONGEST OR MOST TALENTED, OR MOST GIFTED PERSON IN THE ROOM, BUT YOU CAN BE THE MOST COMPETITIVE." It's been a few days since we lost University of Tennessee's Lady Volunteers Head Coach, Pat Summitt. She passed at 64, after being diagnosed with Alzheimer's Disease 5 years ago. Pat was the prototype of perseverance in women's sports. She changed the game– starting out as a head coach at 22 years old, when no one ever gave a second thought around women's basketball– or women's sports in general. What we Love about Pat is that she created something from nothing. She saw the magic behind women athletes, so she set the trail ablaze. 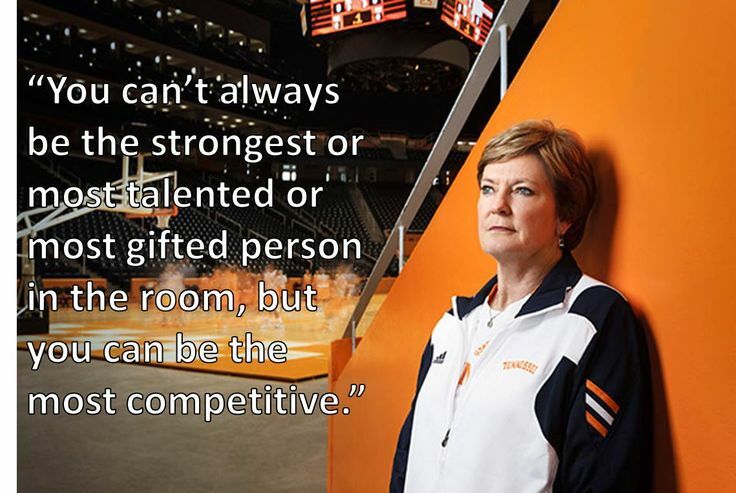 Pioneering the sport as a woman head coach in her 38 years at Tennessee, Pat won eight national titles and 1,098 games -- the most by any Division 1 basketball coach, male or female. Her teams made an unprecedented 31 consecutive appearances in the NCAA Tournament. Pat offered support that encouraged, uplift, and empowered those around her to reach their dreams and to create the path for other young athletes to do the same. She is the ultimate game changer and we are so fortunate to have her a part of our sports history books, we are forever grateful for her story.